All that has ratcheted up the pressure on a player who won't turn 17 until Sept. 1. "It really isn't fair to put those expectations on Nathan," Central Scouting's B.J. MacDonald told NHL.com. "It's a tough label to carry. You're comparing him to Crosby, who has been the premier player in the NHL in the last number of years and probably the foreseeable future. That's tough. "I think eventually, as it progresses, he'll end up developing his own style and his own character and if he's as good a player as everyone is projecting he is he'll carve out his own little niche." Central Scouting's Chris Edwards also warned against excessive expectations for MacKinnon. "He's a really good skater, is solid on his skates and has really good playmaking ability … excellent hands," Edwards said. "We need to temper those comparisons to Crosby, though. Just because he comes from Cole Harbour and went to Shattuck, everyone seems to automatically compare him to Crosby. That's ridiculous, and it's not his fault the media hype gets shoved on him. The experts come out and start making comparisons … who he's going to be. Bottom line is he's a heck of a player and we'll wait and see what he's going to be next season." One other player who should be high on the draft lists of many scouts next season is defenseman Seth Jones of the U.S. National Team Development Program. In 45 games with the USNTDP in 2011-12, Jones had five goals and 23 points. He'll play for the Portland Winterhawks of the Western Hockey League in 2012-13. 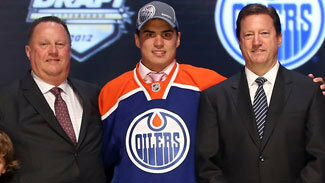 "If there's a defenseman better than him next season, I'm looking forward to seeing him," Edwards told NHL.com. "He's a solid, big guy who handles the puck very well. He's also very smart." NHL Central Scouting Director Dan Marr feels that while the aforementioned players are top notch, they will be challenged for top honors on the 2013 draft board all season. "Nathan and Seth are two players who have received significant viewings and evaluations and they're well known in the media and by hockey fans," Marr told NHL.com. "There are other players that'll come into the mix really quick. There's no runaway leader here. At the top end, there are quite a few players who are going to be in the mix here. I think 2013 is shaping up to be a good year."